Although this blog is devoted to spreading the love of children's reading, there are times that I just have to give a shout out for a book that's bringing me some sanity as a parent. Our oldest has entered the wonderful world of tween-dom, and her world and ours have certainly changed. So when I heard about Getting to Calm one day after a morning full of door-slamming, stomping and shouting, I wondered if someone had known this was just what I needed. 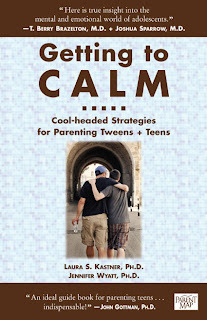 If you're in the midst of parenting tweens or teens, check out this level-headed, practical, ultimately reassuring book. In Getting to Calm, Drs. Kastner and Wyatt provide practical advice and useful tools for how to manage our emotions as parents. I have been stunned by how angry, hurt or frustrated I've gotten with my own child's comments or behavior. I know that I need to remain calm, but what do you do when you reach that breaking point? This book helps navigate these waters, providing ways for me to manage my emotions in the heat of the moment, and then how to steer the ship during calmer waters. I particularly liked the balance the authors give between current brain research into the behavior of adolescents, and practical experience as parents and psychiatrists. Kastner, 55, is a clinical associate professor of psychiatry and behavioral sciences at the University of Washington. She also runs a private practice with a focus on children, couples and families, and has two college-aged children herself. - effective communication, where each person's perspective is considered and respected in a calm, reasonable way. With headings like "Staying Calm in the Face of Rudeness," "When-and Why- Teens Don't Use Their Heads" and "What Am I, Chopped Liver? ", give practical and reassuring advice to parents. Throughout are family stories, such as "Family Story: A Savvy Mom Avoids a Mother-Daughter Tornado", that illustrate the science that is the basis of Kastner and Wyatt's advice. For more, check out the piece on National Public Radio from last August: Experiencing Teen Drama Overload? Blame Biology. Two other parenting books I'd highly recommend are Uncommon Sense for Parents With Teenagers, by Michael Riera, and NurtureShock, by Po Bronson and Ashley Merryman. The review copy was kindly sent by the publishers. If you make a purchase using the Amazon links on this site, a small portion will go to Great Kid Books (at no cost to you). Thank you for your support!